Tribeca New Music Festival: Pamela Z, Bora Yoon, and Luke Dubois :: June 9, 2010; 8:00 pm :: Merkin Concert Hall, 129 West 67th Street, New York, NY. In a shared concert with Bora Yoon and Luke Dubois, Pamela Z will give a solo performance of works for voice, electronics, and video, including excerpts from some of her large-scale performance works. Bora Yoon will perform a duo set with video artist Luke Dubois, Pamela Z will perform solo, and then all three will come together for a sonic and visual trio. They will be joined by the vocal quartet New York Polyphony for this final Tribeca New Music Festival evening. Bora Yoon is an experimental multi-instrumentalist, composer and performer, who creates architectural soundscapes from everyday found objects, chamber instruments, digital devices, and voice. 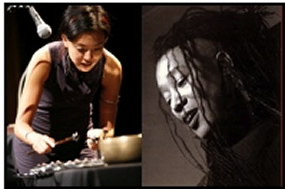 As a solo performer, Yoon has toured her original soundwork ( (( PHONATION )) ) internationally, presenting at Lincoln Center, Brooklyn Academy of Music, the Nam June Paik Museum in Seoul, Patravadi Theatre in Bangkok, the Bang on a Can Marathon, John Zorn’s Stone, the annual Pop!Tech conference, and universities across the globe. Her music has been presented by the Electronic Music Foundation and electronics giant Samsung; commissioned by the Young People’s Chorus of NYC and the SAYAKA Ladies Chorale of Tokyo; awarded by Billboard, BMI, and the Arion Foundation; and published by MIT Press, Swirl Records, and the Journal of Popular Noise.